Occupational therapy is a skilled treatment that helps individuals achieve independence in all facets of their lives. Jody is originally from Sioux Falls, SD and graduated from South Dakota State University with a Bachelor of Science degree and the University of South Dakota with a Master of Science degree in Occupational Therapy. Jody is a member of the American Occupational Therapy Association and the South Dakota Occupational Therapy Association where she served as President from 1998-2000. 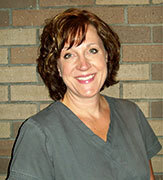 Jody has worked in skilled nursing facilities for over twenty years. Jody has specialized training in fascial movement taping, low vision rehabilitation and the Graston Technique, instrument assisted soft tissue mobilization. After graduating from high school Kara graduated from Lake Area Technical Institute with an Associates of Science Degree in Occupational Therapy Assistant. She is a member of the American Occupational Therapy Association and has had skilled training in geriatric acute and rehabilitation settings. People of all ages experience problems that significantly affect their ability to manage their daily lives. With the help of occupational therapy, many of these individuals can achieve or regain a high level of independence. Occupational therapy helps people make the most of their abilities. When skill or strength cannot be improved or developed, occupational therapy offers creative solutions and resources for carrying out the person’s daily activities. Improving abilities to carry out activities of daily living such as dressing, toileting, bathing, cooking, cleaning, etc.